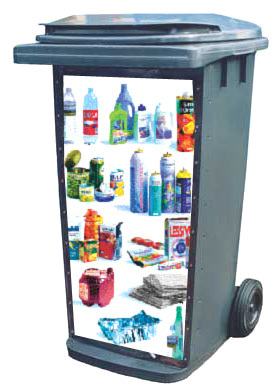 Under the single stream system, residents combine paper and containers in a single bin or bag. The bins or bags are collected and placed in a truck. When the bins or bags arrive at the MRF, the recyclables are sorted. The impetus for adopting single-stream was twofold: a belief that the added convenience of not needing to sort would entice more residents to participate in their curbside programs, and the desire to save money by reduced collection costs. While collections costs are lower with a single stream system, processing costs are much higher. Single stream recycling was introduced in the late 1990s as a lower-cost alternative to "dual stream" collection: the predominant method of curbside recycling at the time ("source-separation," where each material type is kept in a separate bag or bin, and trucks have three or more compartments, was the predominant method of collection in the late 1980's, but had all but been abandoned in the U.S. by the mid 1990's). Under the dual stream system, residents usually combine all their food and beverage containers (aluminum and steel cans, glass jars and bottles, and some or all plastic bottles) in one bin, and they put their newspapers and/or mixed paper (such as junk mail, cereal boxes, and home office paper) in another bin, or in a brown paper grocery bag. The two material streams are picked up and placed in separate compartments on the recycling truck, and taken to a processing center (a materials recovery facility, or MRF). The fiber is sent to market with little or no processing, and the containers go through a variety of automated sorting equipment and hand-picking before being baled or containerized and sent to market. There are also hybrid co-mingled systems where plastic and metal, and sometimes paper, is combined, but glass is kept separate. There is significant evidence that the resulting scrap material quality (and hence the revenue) is lower under single-stream collection than it is under a dual stream system or under systems like container deposits, where materials are kept separate. There is a particular concern that glass shards and PET bottles can contaminate paper loads and wreak havoc in a paper mill, and that glass, plastic and aluminum containers cross-contaminate each other. 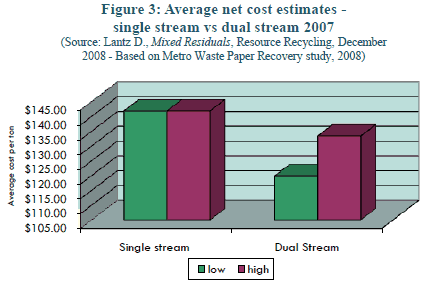 Figure 3 from CRI's study, Understanding economic and environmental impacts of single-stream collection systems. While collection costs are lower in single-stream systems, processing costs and the costs associated with disposing of contaminated materials are higher. Overall, single-stream costs about $3 more per ton than dual-stream. Is single-stream recycling service the salvation of all recycling programs or is there a better way forward? Our author digs into the untold story of real residue rates and a PREFERABLE METHOD to truly recycle more materials at materials recovery facilities. 3. In Oregon, almost all residential recycling and much commercial recycling is collected as commingled material. Oregon programs pick up glass containers separate from other materials or do not include glass in the on-route collection program, choosing to collect glass through recycling depots or some other method. This is unlike single-stream collection programs in much of the rest of the nation that collect all materials, including glass, mixed in together.